Funny, biting and never anything less than human, Lady Bird is an assured directorial debut for indie darling Greta Gerwig. Through her writing and directing, she seems to have absorbed the best qualities of frequent collaborator Noah Baumbach while infusing the film with a personality that feels decisively her own. The characters feel real, the dialogue is snappy and full of witty interplay and it’s all neatly packaged into a brisk 93 minutes meaning Lady Bird never loses its edge. 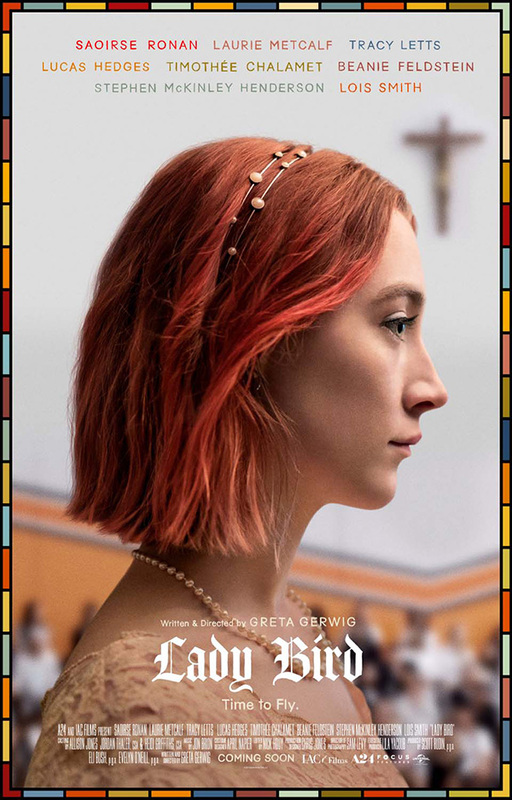 In the titular role, Saoirse Ronan stars as Christine McPherson, a rebellious seventeen year-old who dyes her hair pink, eats communion wafers like snacks and insists that everyone call her Lady Bird. Living in the anaemic suburbs of Sacramento, California (as characterised by an opening quote from Joan Didion), the film follows Christine as she navigates her last year at a Catholic high school from shifting friendships, first loves and, of course, prom. Despite containing all the requisite elements, calling Lady Bird a coming of age story feels reductive as the film ruminates on parenthood just as much as it does on adolescence. Christine’s strained relationship with her mother is an integral part of the story and the depth afforded to her parents ensure they are not simply ancillaries to Christine’s own personal growth. On the other hand, Christine’s relationship with her father, Larry (Tracy Letts), is less tempestuous but marked by a brewing sadness. Having recently lost his job and struggling with depression, Larry has to come to terms with the fact that his daughter will soon move out to go to college. The poignant scene the two share together on Christine’s eighteenth birthday is pronounced by the mutual understanding that the transition into adulthood means letting go. The film is remarkably well balanced in its depictions of both sides of the coming-of age narrative. The trials and tribulations experienced by both Christine and her parents’ is why Lady Bird will likely feel relatable to audiences of all ages. Even so, Gerwig has stated that she wrote the character of Lady Bird as the opposite to how she was in high school. Perhaps then, Lady Bird feels relatable, as through Christine she has crafted a character for the rebellious, non-conformist streak within all of us. Previous ArticleWhat's your Fashionista Speed?